(1971) Granada Restaurant, Burbank | Remains of L.A.
-Incredibly busy and bright, full of paintings and flowers and, above the cash register, a huge parrot hanging from the ceiling. Easter decorations (this was two days before Easter) were everywhere; bunnies and eggs and all sorts of things, but even aside from the seasonal stuff, it was a blast of color. 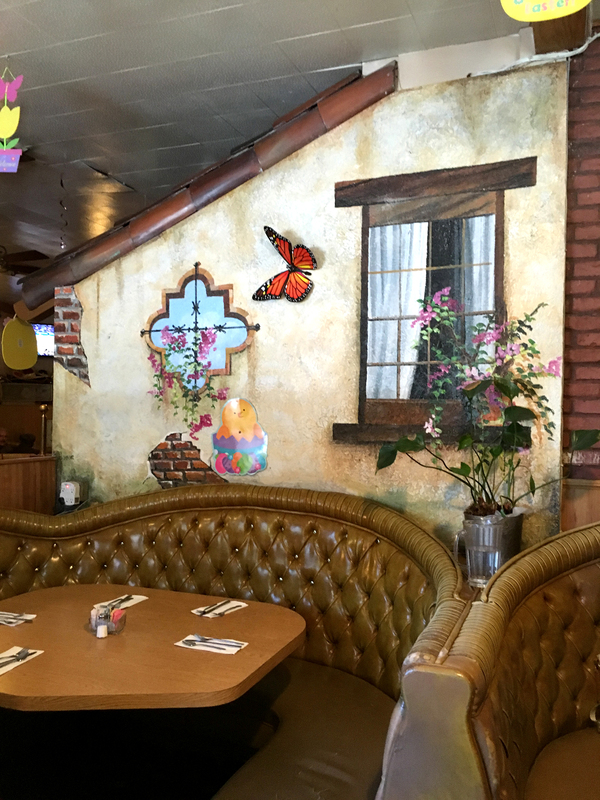 There was what appeared to be a large wood recreation of the Mayan calendar, and ornate gold mirrors, and murals and plates and giant butterflies and fancy hanging lamps. Best of all was a fake house exterior hiding the kitchen; with fake brick under fake stucco and fake curtains inside the fake windows. I don’t know if I could have loved the place more. 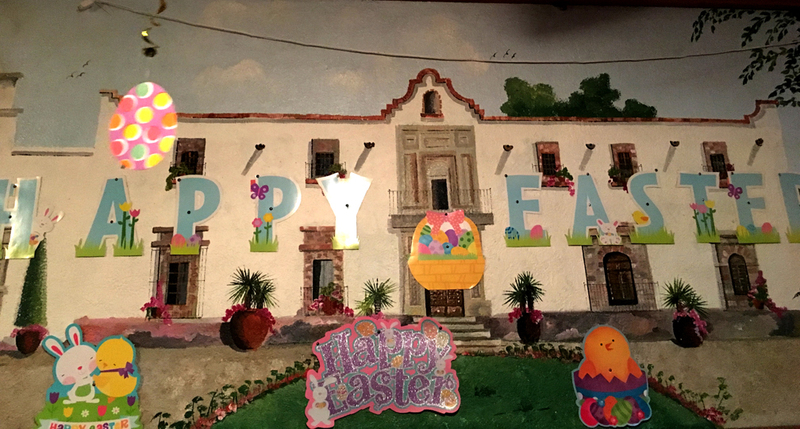 It would have been wonderful even without the Easter decorations hanging off everything, but the bizarre incongruity made it intensely marvelous. 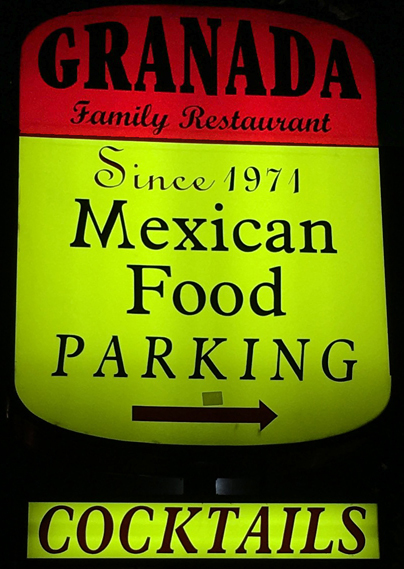 -I got the small tamale combo, which came with rice and beans and turned out to be the exact right amount of food. The waiter asked if wanted chicken or beef and I asked what he liked best and he said the beef, and I was right to trust him. Also we shared chips and salsa and guacamole. There was some interesting flavor to the salsa that I couldn’t put my finger on but liked very much. -Two seconds after we sat down, I lost my napkin. I know you’re thinking it fell on to the floor and while I agree that that makes the most sense, I swear I looked and looked. It was bizarre and I had a little bit of trouble just letting it go. -Our booth had something I’d never seen before; a divider that separated one large, oval booth into two smaller, almost circular booths. The divider was padded like the booths and large enough that I couldn’t see the person sitting directly on the other side, but clearly able to lift right out if a large party came in. I was very impressed with it, and greatly admire whoever built it. I told Kate that I wished we knew a little bit more about the people in the booth with us in case we had to side with them against people in another booth, and then we talked about an essay I read once in which a commuter said that every morning he’d pick who on the bus he could count on to fight at his side if they were attacked by some other bus, and then Kate said that when she used to ride the bus she’d try to pick out who would do what if the bus was suddenly transported to a desert island. It made me want to ride a bus. -On one wall was a beautifully oil painting, a map labeled “The Old Spanish and Mexican Ranchos of Los Angeles County. In addition to the names of the ranches, there were pictures of oxen and houses and, in the corner with the ocean, ships and whales and jumping fish. -The variation in the staffs’ uniform was kind of confusing. The bus boys were very dressy, in vests and bow ties, but the waiters wore casual red Polo shirts. And then some people had on striped blue-and-white oxfords. I kind of liked it; it made the staff seem as cheerfully jumbled as the decor. -A guy came up to talk to a waitress right in front of our table and I got excited because I thought he was a celebrity–someone I definitely recognized but couldn’t quite place–but then I realized he was just some guy who’s always at the library. -When the guacamole came it had a big dollop of sour cream on top but I didn’t let it ruin my supper; I just used a chip to push it over to one side and block it from view while simultaneously keeping it from affecting the rest of the guacamole. I feel I was quite mature about it. -Lots and lots of people came in while we were eating, in twos and threes mostly. I couldn’t figure out where they were sitting, as the place looked quite small from our booth. 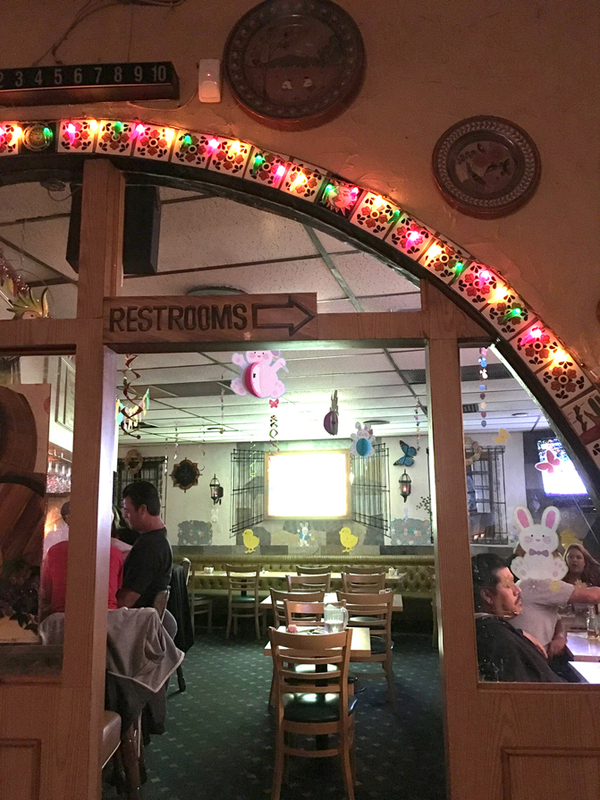 But when I got up to use the ladies’ room, I saw an arched doorway, through which was another room with a bar and TVs. The arch was particularly lovely, with colored lights over colorful tiles. 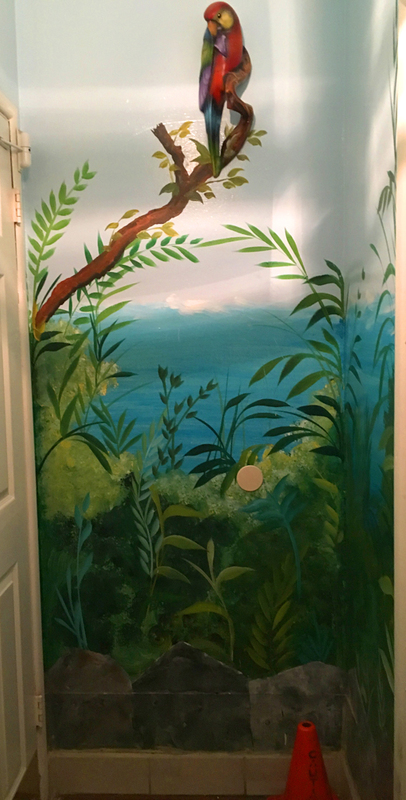 -To get to the bathrooms one has to walk through a corner of the kitchen, but the little hallway with the rest room doors was stunning, painted with a magnificent jungle mural, all blues and greens. The ladies’ room was pretty too. I appreciate it when bathrooms are nicely decorated; it makes me feel cared for. -A guy came and filled our water, and maybe got a little too enthusiastic or something I don’t know, but my water was filled to the absolute brim. There was no way in the world I could have picked it up without spilling, and we did not have straws. I hoped Miss Manners would forgive me, but I didn’t see any way out–I had to lean over the table and take a sip from the glass without touching it. It was over fast, and Kate swore she didn’t judge me. -Kate wondered about the proper pronunciation of the word “succor.” I told her how to pronounce it, 100% certain I knew, but then immediately began doubting myself, because how awful would it be if I was wrong. Finally we looked it up. Checking the correct pronunciation of words might be the best thing about the internet. I wish it had been around when a certain ex-boyfriend of mine insisted that “politic” should be pronounced like “political” without the “al” rather than like “politics” without the “s.” I suppose I could find him on Facebook and post on his wall about it, but, well, that wouldn’t really be politic. 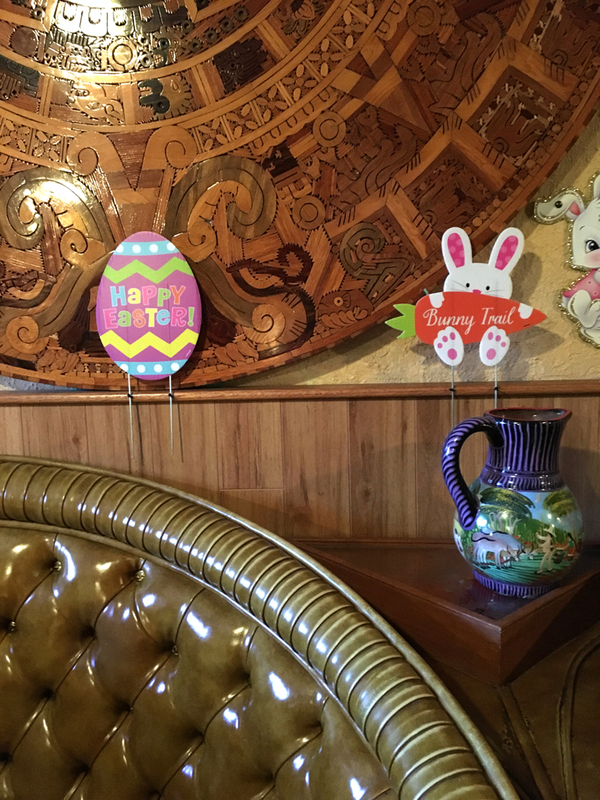 -The really gigantic wooden replica of the Mayan calendar was on the wall to our right, but on the wall to our left was a much smaller wood replica of the Mayan calendar, maybe a foot high. Kate suggested it was a Mayan day planner. -As we were leaving, I heard the woman on the other side of the booth divider say, “So what are you doing for Christmas? I mean Christmas. 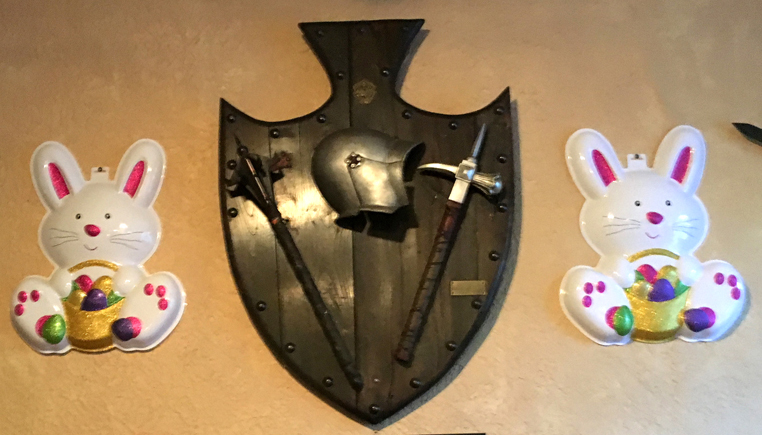 I mean, I mean, Easter.” So maybe it was just as well that there was a divider. -There was a sign by the door talking about a special two-for-one combo deal on Mondays and Tuesdays. After stating the deal, it said, “Highest price applied. Not available for take-out. Not available for certain holidays. Not for children under 5. No separate checks. One per customer.” At first it seemed extremely uptight but then I started thinking that maybe the provisions were added one at a time, over the years, as people found new ways to be jerks. It was a very good deal either way. -Just as we were leaving, and I was taking a few more pictures, the hostess said, “You like the decorations, huh?” and when I honestly said yes, very much, she said “so do I” and smiled in such a proud, pleased way, it made me love her as much as I loved the decor. What Sort of Ghost I’d Expect to Find if I Believed in Ghosts Which I do Not: Three small children who beg to be taken to Granada any time anyone suggests eating out. Note: Unless otherwise stated, all ghosts mentioned in this blog died peacefully of old age and then reverted to the age/place of their choosing.